Known to the world as Freddie Mercury, Farrokh Bulsara was born into the Parsi community in Zanzibar. His parents were from the Gujarat region of India and from the age of eight he studied at a boarding school near Bombay. He remained in India until the age of seventeen when he moved with his parents to England. After gaining a Diploma in Art and Graphic design he joined a series of bands, some more successful than others, until in 1970, at the age of 23, he joined guitarist Brian May and drummer Roger Taylor to form “Queen.” Estimates of Queen's total worldwide record sales have now been set as high as 300 million; their records have spent more collective weeks in the UK Album Charts than any other musical act and ‘Bohemian Rhapsody’ – written by Mercury – was voted as the greatest song of all time by the Guinness World Records. Queen became one of the biggest stadium rock bands in the world, and their performance at Live Aid in 1985 is still regarded as one of the greatest in rock history. As a music legend and icon he has been referred to as Britain’s first Asian Rock star’ and named by Time magazine as one of the most influential Asian heroes of the past 60 years. 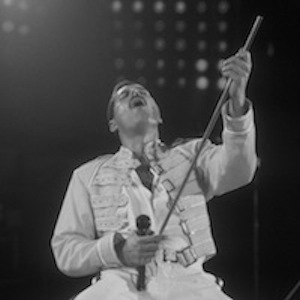 The Freddie Mercury Tribute Concert held at Wembley in the year after his death was televised to over 1.2 billion viewers worldwide and raised over £20,000,000 for AIDS charities. On the 5th September 2011 – which would have been Freddie’s 65th birthday – Google marked the date by dedicating to him, its Google Doodle.